At Yanapuma Foundation we believe that our donors, partners and beneficiaries deserve to know how Yanapuma is governed, how we spend our money and how we are internally organized. We are committed to the principles of transparency and accountability and to that end we publish our internal working documents, financial statements and annual report. Please feel free to communicate with us if you would like any other information about our organization. Our Spanish schools, travel agency and Volunteer programs provide the principal funding to cover our basic administrative overheads, which means that we do not need to include high levels of overhead in any funding applications that we make. This also gives us a measure of independence as we are not reliant upon receiving funding in order to remain alive as a foundation. However, our level of activity as a foundation remains tied to the level of funding that we are receiving. When a donation is made we establish or add the funds to an existing account, and as the funds are used we keep a running balance for each community account or particular project account. So whether the donation or project funding is $200 or $200,000, we will always be able to account for how the funds are being used, and are happy to be in regular contact with donors regarding progress of any particular project. Our bimonthly newsletter contains details of our ongoing projects. From 2012 to today we have received funding from a variety of international sources. Inter American Foundation / Yanapuma - 4-year project with the Tsa'chila to improve cacao production, create vegetable gardens and teach nutrition and diet, as well as capacity building and organizational skills. Click here to read bi-annual reports of the project (in Spanish). Yanapuma funds scholarships for children and youth to study at elementary and high school and beyond from various locations in Ecuador. UN Trust Fund on Indigenous Issues / Yanapuma - 1-year project to develop sustainable income options through crafts production and traditional culture. Ferguson Charitable Trust/ Yanapuma - 1-year project to develop vegetable gardens along with diet and nutrition education. Below is the final tally for the 4-year project co-funded by the Inter American Foundation. 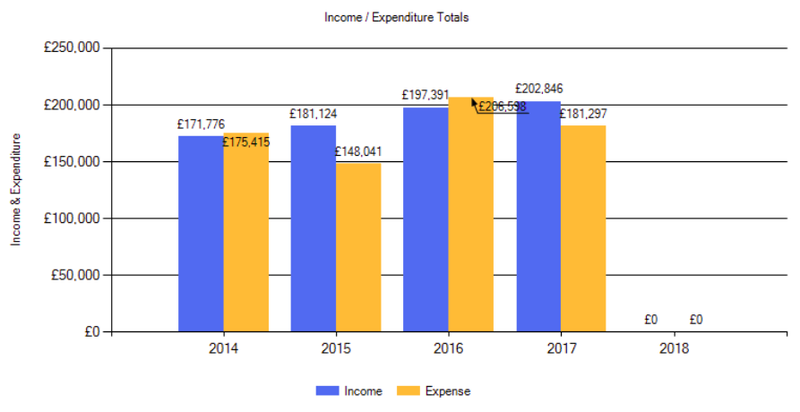 The graph below shows the annual declaration for Yanapuma Foundation of Scotland from the Organization of Scottish Charities Register (OSCR).